1 cup of quinoa cooked in 2 cups of water. Bring to low boil then turn down to low for 20 minutes. 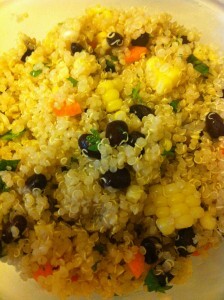 This entry was posted in Main courses, Recipes, Side dishes and tagged beans, Cleansing, kid-friendly, local, Salads. Bookmark the permalink. Both comments and trackbacks are currently closed.